Chris started out my day with an unexpected Romantic boat trip on Lake Minnetonka with Dave and Heather. The weather was looking pretty good. I decided to wear shorts and muscle shirt so I could get some sun. We headed over to Dave’s around 11:o0am so we could stop by for a quick bite to eat at Maynards in Excelsior Bay. Driving down to Lake Minnetonka the sky started clouding and getting dark. Even though our crack meteorologist said 80° and sunny! We were all hoping for nice weather but its Minnesota. We only get a few good days in the spring and fall. Unfortunately this day was not looking so good. We arrived at Maynards 45 minutes prior to the boat launching. The server at Maynards was excellent and he was aware of our time restriction. The food was great and we had plenty of time to eat it. As luck would have it, as soon as we were done eating the rain started! We all rushed over to the boat and waited until they put the cover on top. Even though we had rain, the 90 minute cruise was nice. I enjoyed my time with Chris even though there was two couples with kids on the boat! What part of romantic don’t you get people. Keep your undisciplined kids at home! Chris and I wanted to host Fathers Day with my family. We invited my parents, Dave and Heather too. After our Romantic Boat trip we headed home. There were a couple things Chris wanted to prepare before the family showed up. As Chris was preparing the food I wandered down to the cellar looking for a really nice treat. I pretty much knew what I wanted before I ventured down. 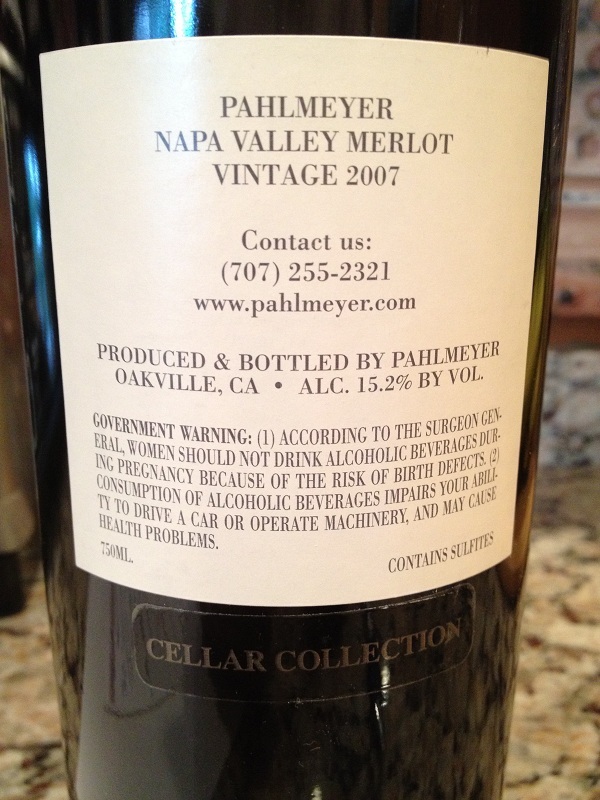 I have had the Pahlmeyer Merlot many times over the years. I think of all of the Merlot’s we have drank this is the number one! I grabbed the bottle and came back up. I was hiding the bottle as I wanted to surprise Chris. I quickly grabbed my tasting sheet and a cork screw. I cut away the foil and pulled the cork. The cork pulled out very easy with a slight pop. As I was pulling the cork I noticed wine half way up the cork. I was not really nervous but for a 2007 it should have looked better. After further inspecting the cork was a little rubbery and would not break. I guess the cork has a few years left in it. If I was to cellar it many years I might contact Pahlmeyer and see if the bottle could be re-corked. 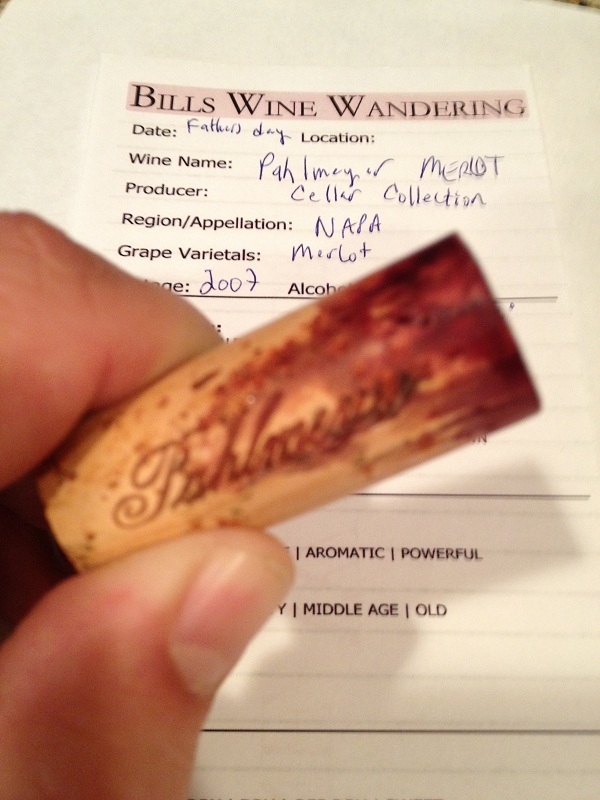 I was anxious to try the Pahlmeyer Merlot. I quickly poured some into Chris’ and my glass. As I started making my notes I gave Chris her’s and said try it. She immediately lit up after the first smell. She did not wait a moment and gave it a try. She was humming and said Raspberry and Strawberry Jam to the nose and taste! She loved it! 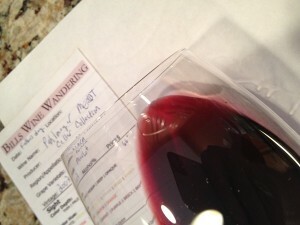 Looking at the Pahlmeyer Merlot I noted it was clear in the glass. I did not notice any sediment. The color depth was medium and the hue was purple. Smelling the Merlot it was slightly aromatic. I thought its development was still young. The aromas I could smell were like Chris’. The Merlot was definitely “Jammy” like. I was looking forward to try it. As I took my first taste the tannins were medium to soft. The Merlot was not dry (like some bold tannins from a young wine) but was full bodied. The finish was long and nice. 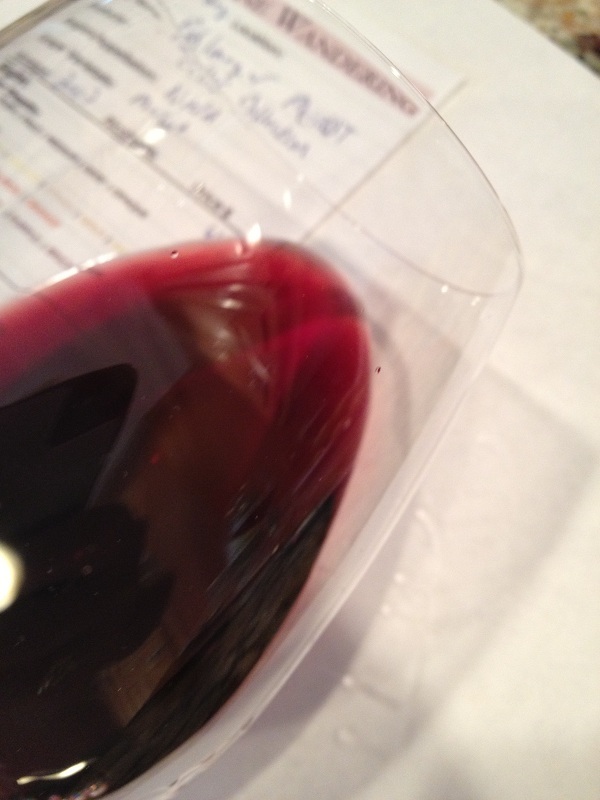 As I took my second taste the soft tannins danced with my front palate and worked its way to the middle. 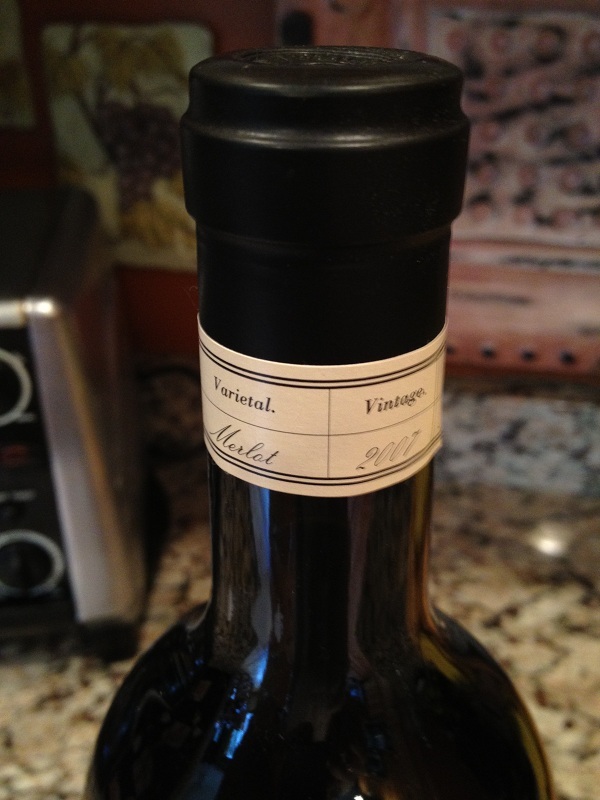 This Merlot is expertly crafted and is excellent. I also noticed the alcohol content is high. It was 15.2%, but I have to say I could not smell or taste any alcohol. 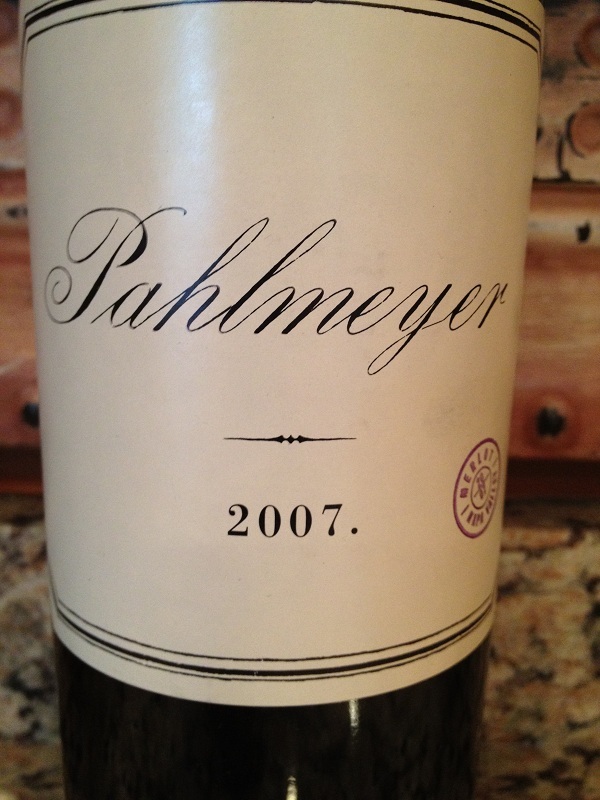 Both Chris and I rated the 2007 Pahlmeyer Merlot four glasses. If you enjoy Merlots like we do, I would contact the winery and buy some for a special event like today!